Stunning 4 bedroom/4 bathroom home located in the foothills of San Luis Obispo. This custom home is well constructed with high quality materials and elegant finishes of hardwood, marble, granite and stonework. Waterford crystal chandeliers are showcased in the entry, dining, kitchen and master bedroom. An abundance of natural light enhances the open floor plan, high ceilings, arched hallways, expansive kitchen, custom painted crown molding and local wrought iron artistry. The master suite offers walk-in closets, dual sinks, soaking tub, separate shower and a private patio with fireplace and outdoor drapes that provide total privacy. Green features include a solar/photovoltaic system. The private back yard is handsomely bordered by mature oak trees and custom designed landscaping with an extensive variety of bamboo. 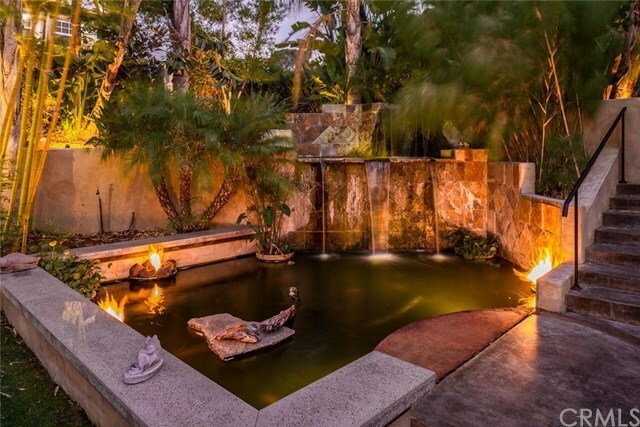 Beautiful outdoor living and entertainment areas host spectacular features that include a cascading waterfall, fireplaces and a filtered 10,000 gallon three-tiered Koi pond with fish and turtles. Wow! An outdoor kitchen and BBQ area and private spa expand the entertainment area which embellishes the home! Information deemed reliable but not verified. Directions: Turn onto Prefumo Canyon Rd, then turn left onto Isabella Way. Home is on the left.